A water treatment plant that uses the lagooning system will generally follow on from mechanical pre-treatment or a complete tratment of activated sludge type (in this case, we have tertiary lagooning). The lagooning system consists of a series of tanks prioritising a specific type of purifying ecosystem. We shall be using international terminology applicable to this field. Anaerobic lagooning can be used to treat urban or industrial wastewater effluents. 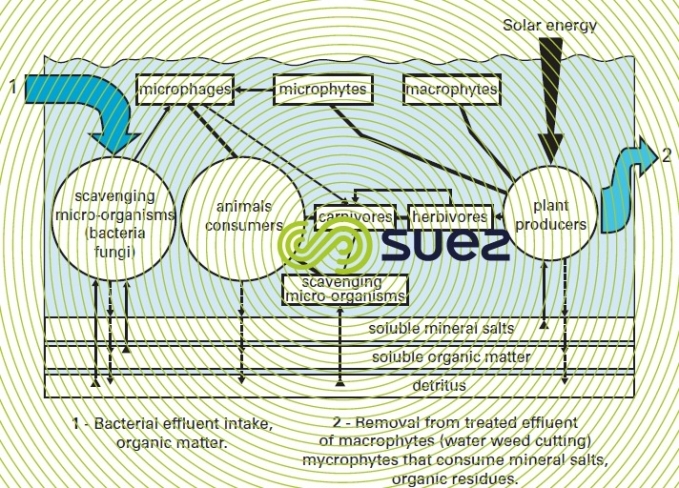 The settle able pollution of urban effluents forms sludge that is gradually digested using the anaerobic method (the organic matter is mineralized and CO2, CH4 and H2S are released).This system is used as a primary treatment for removing the settle able organic fraction from urban effluents and the soluble organic pollution which can be easily assimilated from industrial wastewater effluents (especially agri-food industry). In view of the anaerobic fermentation process applied, this process is only suitable for relatively highly concentrated effluent (household and industrial) and is only effective at temperature above 15°C and optimum beyond 25°C. The danger of olfactory nuisances exists as soon as sulphate concentrations rise above a few tens of mg · L–1 (a concentration of 100 mg · L–1 must be regarded as high). Solutions involving tank covers with or without biogas recovery have been developed for the purpose of eliminating these nuisances. Anaerobic lagooning is an option on sites that are sufficiently isolated and subject to favourable Mediterranean or tropical type climatic conditions. This term comes from the fact that these lagoons located at the primary or secondary phase use aerobic purification processes on the liquid fringe and anaerobic processes in the vicinity of the bottom where sludge settles. Both zones co-exist to variable relative extents depending on the pollution input. Organic loading applied is such that effluent purification is primarily carried out by aerobic bacteria. The oxygen input required is mainly provided by algae photosynthesis, in the case in point, microphytes and, to a lesser extent by surface air/water exchanges that are wind-dependant. These systems are also called microphyte lagoons because they prioritise the development of micro-algae. Solar radiation provides the energy for this algae production. These algae develop from the products of bacterial degradation and from elements that can be directly assimilated in the effluent. In fact, a whole ecosystem made up of bacteria, phytoplankton and zooplankton is responsible for purification. The macrophyte (duckweed, reeds…) development is not required because it affects light penetration. Optional lagooning is the most widespread type of lagooning and used for low concentration effluent and in temperate to tropical climates. Figure 41 outlines the main biological cycles to be found in a lagoon. These are also microphyte lagoons that work in much the same way as optional lagoons but where conditions are essentially aerobic in view of the low organic loading applied at this level of treatment. Used as a secondary and above all tertiary treatment, these lagoons finish/polish effluent before it is discharged and are mainly used to reduce faecal contamination germs in a lagooning system or after a compact treatment (tertiary lagooning).The site of major algae development, especially during hot weather, lagooning will have an impact on the quality of the purified discharge (suspended solids) even when standards include provisions that allow for algae (analysis undertaken on filtered samples). In this instance, the ecosystem incorporates macrophytes or macroscopic plants that include free forms (e.g. duckweed, water hyacinths, water lettuce…) or rooted forms (e.g.reeds). Used in secondary or tertiary treatment on low concentration effluent, the effectiveness of these lagoons has yet to be properly demonstrated.In effect, this technique means that the biomass produced has to be exported at regular intervals and this is a relatively onerous operation. The intensive lagooning version, this system covers significantly less ground area than natural lagooning. Aerated lagooning consists in intensifying aerobic activity through mixing and artificial aeration using floating or fixed mechanical aerators or injected air. 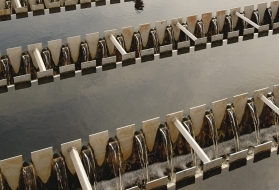 Biological balances are similar to those found in the classic activated sludge process. However, due to the absence of biomass recirculation in the system, the micro-organism concentration remains low and sedimentation takes place slowly. Applied as part of a complete treatment or as secondary treatment after anaerobic lagooning, this technique is ideally suited to concentrated household and industrial effluent. "Facultative aerated" lagooning with the aeration phase taking the form of several cells in series, is the current preference. Power levels vary from 2 to 3 Watts · m–3, sludge settles in aerated tanks and degrades in the anaerobic section. The aeration phase is followed by a polishing lagoon (see maturation lagoon) or by several lagoons should germ reduction be sought.